M Gaye, A Kelani, H Ouiminga, N Sylla, Y Sakho. 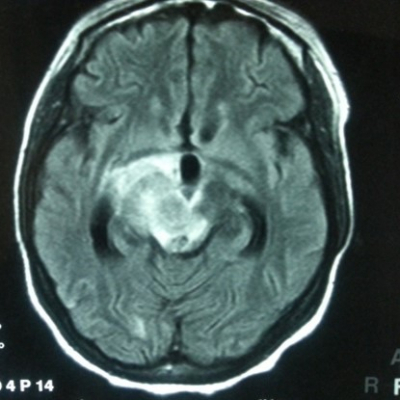 Thalamic Tuberculoma: A Case Report. The Internet Journal of Neurosurgery. 2018 Volume 14 Number 1. 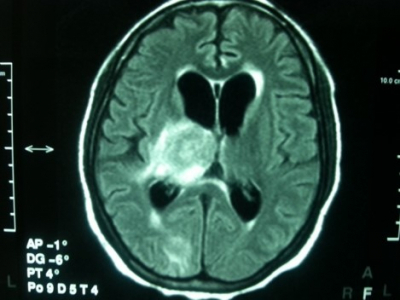 To report a clinical case of a patient with a thalamic tuberculoma looking like a high grade glioma. A pregnant woman of 37 years old, with normal immune system, presenting a progressive left hemiplegia, has been transferred from the Republic of Gambia. She was presenting in the same time, nocturnal fever and weight loss. Brain CT and MRI conclusions ruled for a right thalamic glioma instead of lymphoma or tuberculoma. Stereotaxic biopsy that allows to get safely a specimen of this lesion compared to open surgery is not yet available in our country. Our option was to start tuberculosis treatment test because the lesion could not be extracted. 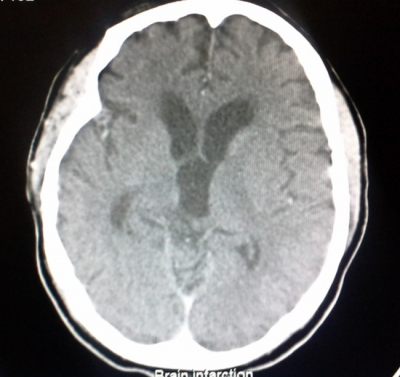 Two months later, Brain MRI showed an impressive regression of the lesion. One year later it completely disappeared, and fronto-temporal atrophy was noted. Clinically there were a brady-psychia and some joint ankylosis. A poor medical setting environment and tuberculosis endemic area could justify the option of a tuberculosis treatment test for a deep seated heterogeneous brain lesion. Senegal as a sub-Saharan country is located in the part of the world where high burden endemic state of tuberculosis exists. Based on WHO (World Health Organization) estimation, 11 millions of patients are still suffering from tuberculosis and 3.5% of new cases were diagnosed . Brain tuberculosis is the more serious extra pulmonary form with a high percentage of neurological sequel. Nowadays, modern imaging tools allow to diagnose more and more brain tuberculoma. But proteiform imaging features and difficulties to access to a deep seated lesion in absence of stereotaxic frame, may increase the option of an anti TB therapy trial. Our patient is a 37 years old married woman transferred from the Republic of the Gambia for the management of an intracranial lesion. While she was two months pregnant, she complained of headaches resisting to the medical treatment with easy vomiting. Progressively is noticed a left hemiplegia, nocturnal fever and weight loss. A naso gastric tube was set. At this time no neuro imaging has been asked only symptomatic treatment using pain killers and anti-vomiting drug have been administrated. She gave birth to a full term living baby, but her neurological status deteriorated. The first Brain CT done in Banjul showed a right heterogeneous thalamic lesion. The lesion contrast strongly after injection of Gadolinium and perilesional oedema (Figure1). She was transferred to our department in Dakar. The physical examination showed a deterioration of the general status with weight loss, confusion and agitation. There was a left dominated crural hemiplegia, a right ptosis without oculomotor deficit. The pupils were normal and the neck was flexible. The blood tests were normal. Brain MRI (Figure 2) confirmed the first CT conclusions. It found another small lesion was located to the right occipital lobe. The lesion was intense in T1 sequence after Gadolinium. The thalamic lesion extended to the right peduncle (Figure 3). Theses imaging features could lead to four hypothesis: metastasis, cerebral lymphoma, high grade lymphoma and a thalamo mesencephalic tuberculoma. A careful investigation to find a primitive cancer using total Thoraco abdominal pelvic CT, thyroid radio isotope scanning, was conducted. Western Blot HIV test was normal. Stereotaxic biopsy would have been the best choice to get surgical sample for histopathology, but it is not available in our country. Open surgery is a very invasive choice for a thalamic lesion in a deep part of the brain. We decided to begin tuberculosis treatment test using four drugs (Rifampicin – Isoniazid – Ethambutol - Pyrazinamid) fort 2 months, then 2 drugs (Rifampicin - Isoniazid) for 10 months. After the two months treatment, it was noticed an impressive improvement of the motility. The patient responded clearly to questions. The naso gastric tube was withdrawn and the patient could eat by herself. General seizures took place and were quickly under control with a prescription of 100 mg per day of phenobarbital. The patient went back to Gambia with recommendation to respect all the prescription for 1O months. One year later during a medical mission to Banjul, the patient was examined. The improvement was remarkable. The patient was in wheel chairs but she could stand up with help. She was alert but with some speech slowing. Left limbs were still weak but joint, function was reduced by ankylosis even though physiotherapy has been done. On Brain CT a complete resolution of the lesion was noticed associated with fronto temporal atrophy (Figure 4). Control Brain CT one year later: complete disappearance of the lesion but a bilateral fronto temporal cortical atrophy is left behind. Haematogenous spread of the bacillus came often from a primary lung infection. Others pathways may exist like via lymph node, liver or vertebral column. Through the history of patients it is difficult to find a tuberculosis primary infection [2, 3]. This 37 years old woman came with a syndrome of high intracranial pressure with a Weber mesencephalic syndrome. This syndrome combined a controlateral motor deficit with an incomplete third nerve palsy related on the extension of the tuberculosis infection into the ipsilateral pedonculus (see MRI). CT scan findings are not specific to tuberculoma. 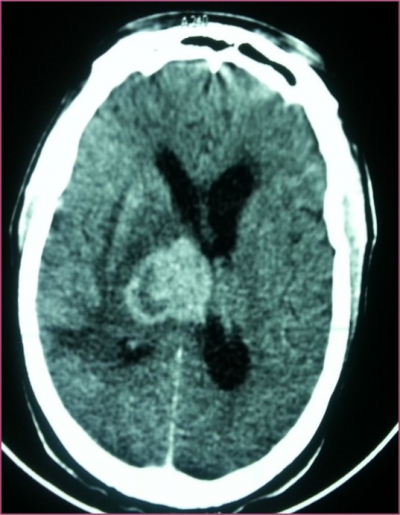 However the presence of ring enhancing lesion (hypo dense central lesion surrounded by peripheral contrast enhancement) may give the impression of brain tuberculoma, especially if the patient resides in one country to high tuberculosis endemic . Sometimes, into the ring enhancing center, a calcified spot lesion could exist. This lesion is described as a ‘target sign’. Nevertheless this sign can be found in many brain infectious and neoplastic diseases like neurocysticercosis, pyogenic abscess, metastasis, high grade glioma , lymphoma etc… ). For this reason our team develops a decisional algorithm . MRI is more reliable than CT that could be negative in front of small or multiple tuberculoma . T2 MRI sequence demonstrated usually multiples punctiforms lesion in hyper signal crippling all the brain parenchyma whereas the CT is surprisingly normal . Spectro MRI is a breakthrough innovation on brain condition diagnosis. Mukherjee and al. in studying the chemical profile of ring enhancing lesion have found that a lipidic peak with a decrease of N-acetyl aspartate (NAA) rate was correlated with tuberculoma whereas in brain cysticercosis there is a lactate increase and a moderate decrease of NAA. One should remember, in case of high grade glioma, spectro MRI profil increase in choline and an important decrease of NAA. In high endemic tuberculosis countries, diagnosis modalities were absent. It is very difficult to make a definitive diagnosis of brain tuberculoma because usualy the symptoms of tuberculosis impregnation not exists. Although in our patient past history, of night fever and weight loss have been noticed. Intra Dermal test for TB is not reliable and the PCR (Polymerase Chain Reaction) is still expensive for the populations. The Bacteriology for extra-pulmonary tuberculosis is less contributed than lung tuberculosis. In fact the tuberculoma sample when it is obtained, acid fast bacilli grow after culture only in 30% . Histopathology diagnosis required surgical specimen sample. Our patient is bearing a thalamo mesencephalic lesion in a deep part of the brain. Open surgery is at risk in our practice condition. Stereotaxic biopsy is an option to get a specimen sample of the lesion . Unavailability of this device in Senegal, lead us to implement for this patient a tuberculosis trial treatment based on WHO therapeutic protocol. The protocol combined rifampicin, isoniazid, ethambutol, pyrazinamide. The treatment should last 9 months sometimes was extended to 18 . At the beginning of Tuberculosis therapy, some patients may aggravate with a paradoxical volumetric progression of the lesion on control CT. To avoid this immune allergic reaction some authors recommend one month of steroid associated with tuberculosis treatment . The cortical atrophy could be explained as a sequel from meningo encephalitis or by anterograde degenerative process of thalamo-cortical fibers that project towards somatosensory cortex because of lesion of pulvinar nucleus and posterior lateral nucleus leading to a cortico basal syndrome . In high burden tuberculosis countries it make sense to take the option of tuberculosis treatment test when a high index of suspicion of deep seated tuberculoma existed and in absence of stereotaxic frame. 5. Mukherjee S, Das R, Begum S. Tuberculoma of the brain-A diagnostic dilemma: magnetic resonance spectroscopy a new ray of hope. J. Assoc. Chest Physicians 2015; 3: 3–8. 6. Bazin C. Tuberculose du Système nerveux central; EMC-Neurologie 1 (2004) 169-92.